The relationship between people, plants and machines is reforming cities: since 2015, researchers from four different countries, conducted by the University of Paderborn, have been researching intelligent plants in the "flora robotica" project. This EU-funded research project involves computer scientists, robotics specialists, zoologists, cell biologists, mechatronics specialists and architects from Germany, Denmark, Austria and Poland. Altogether the project is funded with around 3.6 million Euro. "These 'intelligent plants', led by robot swarms, will enliven our cities architecturally from carefully greened walls to whole houses made from living biomass", explains Jun. Prof. Dr Heiko Hamann from the Heinz Nixdorf Institute of the University of Paderborn. In order to achieve this, the international team of researchers are developing "biohybrid communities" out of robot swarms and plants. Innovative technologies developed within the project are, for the very first time, making it possible for people, plants and robots to communicate with one another on a high level and to achieve common goals. 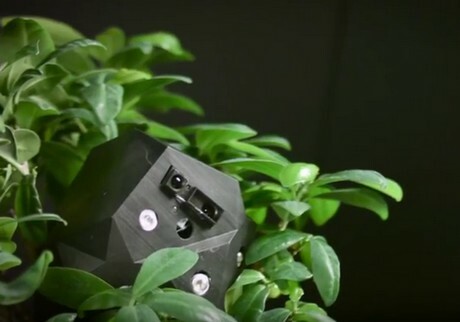 One of the major challenges in the research project "flora robotica" has been to create a communication network between plants, humans and robots. In order to overcome this challenge, the researchers have developed completely new communication channels, which can affect both the short term and long term growth of the plants. Hamann explains, "the robots can tell the plants in which direction to grow and the plants can communicate with the robots what they need in order to do so, e.g. water and light". The robots don't only communicate with plants, they also function as plant-to-people interpreters, "we humans can uses this to work on a completely new type of structured, planned and targeted form of plant architecture" explains Hamann. For the first time, researchers are given information about the condition of the plants by robots in real time. They are therefore able to react before any averse effects take place. In turn, the researchers can also provide information via the robot to the plant. For example, the researcher can communicate to the plant whether or not it is correctly carrying out the desired architectural form or whether it needs to change the way it is growing. Robots are already regularly being used to influence plant growth, for example in automated greenhouses. In flora robotica the researchers take it one step further: their goal is to influence the growth of plants constantly and to create innovative new architectural structures. The researchers become 'builders' in a completely new type of plant architecture. The intelligent plants will help to build sustainable cities and living environments, from "living walls" to furniture to entire houses. In the project flora robotica, however, architectural aesthetics is also important and new, constantly changing, resource-conserving, architectural systems are being created. The combination of a large number of sensors enables communication between robots and plants to be technically possible. These sensors operate on the basis of available technology, such as simple distance sensors and other optical sensors. Additionally, the team of researchers have also developed new technologies, such as biomass sensors, which are based on the distortion of electromagnetic fields, or transpiration sensors, which measure sap flow. Some of the symbiotic robots are stationary, others slowly move in order to keep up with plant growth, such as the control mechanisms using high intensity LEDs and vibration motors. Here, the researchers use blue light to control the plants via so-called "phototropism" where the tip of the plant is attracted to the light sources. Contrarily, light in the so-called "far-red" range (between the spectrum of visible and infrared light) is used to control the plants by repelling them. At the same time, vibration motors are used to limit growth to specific sub-ranges. So far, the interaction between robots and a variety of different plant species, such as bamboo, beans, bananas and tomatoes, has been successfully tested.